Avi Flashenburg, of The Body Tech, is a massage therapist based in Miami Beach, Florida. With more than 15 years of experience, he has worked in several chiropractic and physical therapy offices. He's also dedicated to help people outside the confines of his clinic. For him, part of healing is building a partnership and providing education. Massage is a great tool for relaxation, stress reduction, and rehabilitation of chronic pain and old injuries. It helps re-establish the core connections between body, mind, and spirit, as well as re-grounds us and centers one's being. Avi received Massage Therapy for eight years before becoming a massage therapist. He believes that if you have to wake up every day to make a living, you should love what you do and he enjoys sharing his gift of healing. Many folks who live with chronic pain or restricted range of motion from old injuries and accidents believe there is no alternative. But massage therapy can increase range of motion through passive and assisted stretching and reduce chronic pain by addressing patterns of tension within the body and its release. He attended the Massage Institute of New England in Cambridge, Massachusetts. It was where he was certified in Swedish massage, and was introduced to a variety of other modalities, including hydrotherapy. He also studied Neuromuscular Therapy (NMT) at Educating Hands School of Massage. Prior to massage therapy training, Avi spent 12 years in the financial industry. He worked at Le Pli Day Spa in Harvard Square, where he received further training in spa treatments. There, he learned more about body wraps, salt scrubs, foot reflexology, hot stone massage, and all of the "feel good" stuff. He also worked at the Miami City Ballet from 2007 to 2008. Since 1999, he has maintained his own practice. 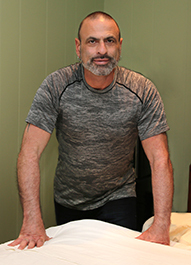 He relocated to South Florida in 2001, not only for the beautiful weather, but because massage therapy is viewed as a health care profession there. In addition, massage therapy is covered under the Florida's Board of Health and governing statutes. Contact Avi for healing massage services.